A 2,000 year-old milestone, which has been unearthed during excavations in the ancient city of Termassos in the southern province of Antalya, might be the sign of a yet unknown ancient city, according to officials. Archaeological excavations in the ancient city of Termessos, located at the top of 1665-meter Güllük Mountain in Antalya, kicked off last year after governor Münir Karaloğlu solved the issue of budget allocation. A 2,000 year-old milestone, built by the Roman Empire Valerianus, was unearthed right next to the entrance gate. 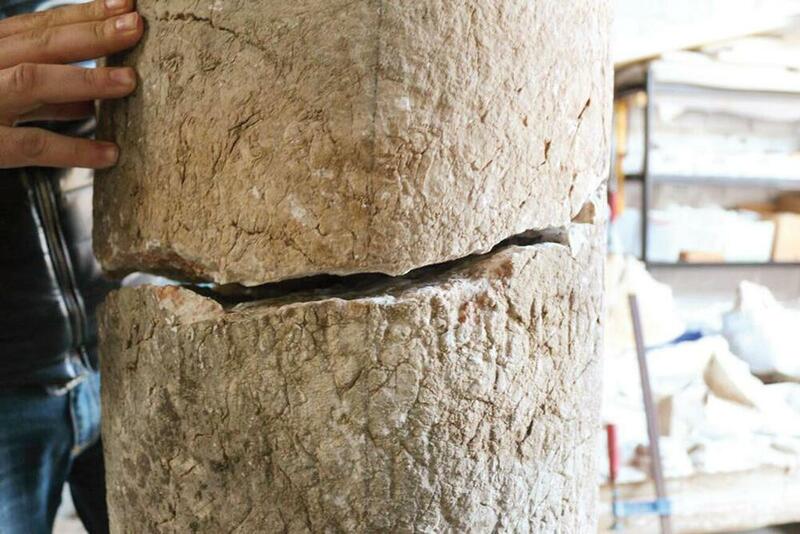 The milestone, which is believed to have been used by other empires, was taken to the Antalya restoration and Conservation Center Laboratory for the renovation of cracks and broken pieces. The Antalya Director of Surveying and Monuments Cemil Karabayram said the milestone showed the distance between two cities. Karabayram said the writing on the stone still existed and the work to translate it was ongoing. “This stone is made of a special limestone. It is the first milestone found in the Termessos area. It is possible the stone talks about the existence of unknown ancient cities. This stone might be the beginning of the restoration process in the new city. There might be an ancient city in Termessos that we do not of know yet,” he said. The Cultural Heritage and Museums General Director Yalçın Kurt arrived to examine the area after the milestone was discovered, said Karabayramat. He added that Culture and Tourism Minister Numan Kurtulmuş ordered the milestone to be moved to Termessos and would examine the area soon. Termessos is a very important city that belonged to the Pisidia region in the north of Antalya. Alexander the Great surrounded the city in 333 B.C. but failed to conquer it. The current ruins in the city are from the Hellenistic, Roman and Eastern Roman eras and include walls, Hadrian’s triumphal arch, the cisterns, the theater, the gymnasium, the agora, the odeon and the heroon. Among the tombs are those of Alcates and Agatemeros and a sarcophagi with a lion figure. Termessos, which was abandoned in the fifth century, also draws attention to cemeteries that are from many different eras and depict many different styles.